In August 2017, some friends and I started a company called Halseo to produce Battery Jam. Since then, I've acted as Creative Director on the title. My responsibilities as a member of a small team have been broad but my main areas of focus have been concept and art direction on every part of the game from characters and environments and particle effects. If you're interested in where the game was after our work on it as students, you can check out a bunch of information right here. 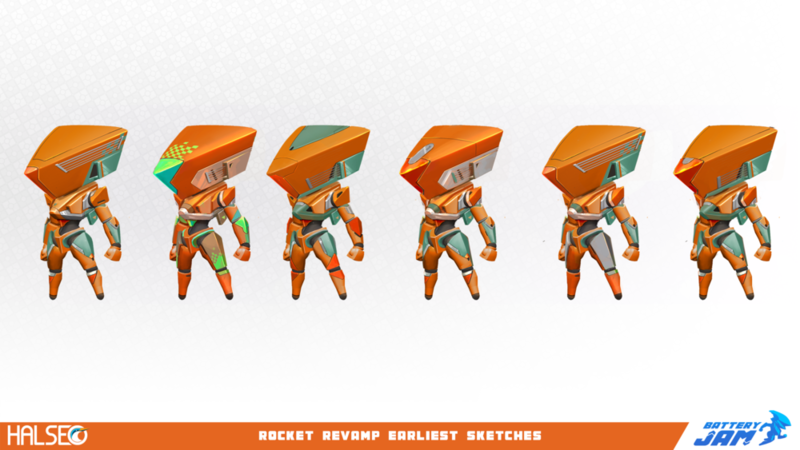 Below are some of the concepts pulled from our character revamp. We stuck close to the original designs as we had really consistent positive responses to them, but once we started fleshing the game out more we decided to step away from the instruments that were originally placed on the characters heads. I spent a lot of time trying to nail down ideas on how to brand not only our company, Halseo, and the game, but in game companies to fit the lore we wrote as well.